I often use a short, icebreaker to introduce design storytelling in talks and classes. 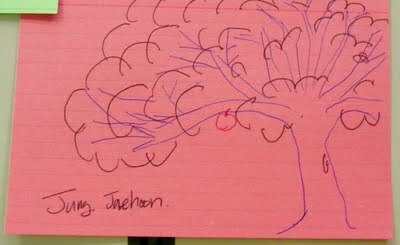 I hand out an index card and ask people to draw a tree in 60 seconds. I’ve adapted this from Thiagi’s 99 second Draw a Tree exercise. 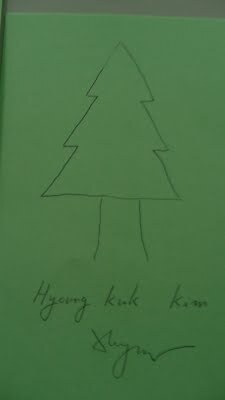 I ask attendees to draw a tree, any old tree, and to be sure to autograph it as there will be a prize. At the conclusion of the exercise I pick someone at random to receive a small gift or book. I have collected hundreds of drawings, some are very beautiful. 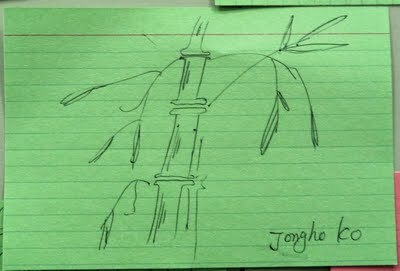 Rarely I get drawings of bamboo. 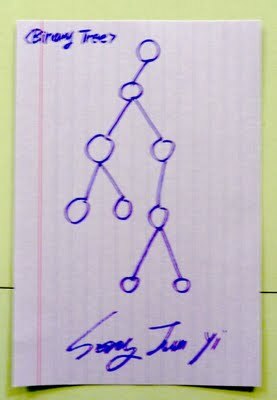 Invariably one nerd who wants to win the prize and show off his computer geekiness draws a directed graph. After all, he doesn’t know the criteria I’ll use to choose a winner (none, it is a random drawing). But most draw physical trees. I get canonical tree shapes: mainly deciduous trees, with and without leaves, and a few conifers. After I’ve collected the drawings, I ask how many drew roots and if so, why? If not, why not? Invariably, as Thiagi observes, most do not include roots, but some include roots or hints of root structures. 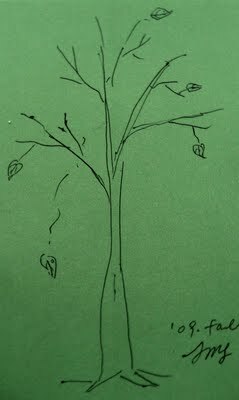 When asked why they didn’t draw any roots, invariably the answers is, “Because I drew what I can see. No need to show what’s below ground.” When asked why they included roots, those who did answer, “Because trees have roots.” Some software folks are very detailed and want to show everything. I’ve even received trees with tree parts labeled. And there is my hook into the art of design storytelling. It depends upon your audience and the goal for telling your story whether you should include roots or not. There’s no “right” answer. Depending upon what your audience already knows and what you want to focus on, it is perfectly OK to leave out certain details. The art of effectively drawing or describing any aspect of a software design, is to knowing what to leave out. It’s just as important to know what to omit as it is to know what to include. There’s always more detail. Effective design storytelling leaves out unessential details so that the important stuff can get emphasized. 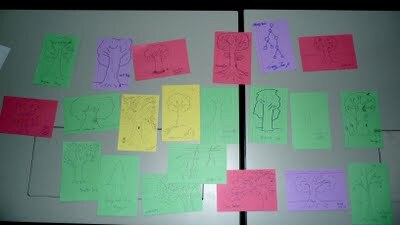 This entry was posted in Software Design, Teaching techniques and tagged assumptions, drawing, icebreaker, index cards by Rebecca Wirfs-Brock. Bookmark the permalink. Drawing is a form of visual expression and is one of the major forms within the visual arts. There are a number of subcategories of drawing, including cartooning. Certain drawing methods or approaches, such as “doodling” and other informal kinds of drawing such as drawing on a foggy mirror caused by the steam from a shower, or the surrealist method of “entopic graphomania”, in which dots are made at the sites of impurities in a blank sheet of paper, and lines are then made between the dots, may or may not be considered as part of “drawing” as a “fine art.” Likewise tracing, drawing on a thin piece of paper, sometimes designed for that purpose (tracing paper), around the outline of preexisting shapes that show through this paper, is also not considered fine art, although it may be part of the draughtsman’s preparation.